Light and crispy, and even gluten free, these Swedish Almond cookies are perfect alongside a cup of afternoon tea with friends! Spending time in the kitchen with my Grandmother is full of fond memories. We would talk for hours overs while we made pumpkin pie, Swedish meatballs and cookies by the dozen. It was a peaceful time, where flour and sugar were everywhere and the giggles were non stop. Add in a cold glass of milk, or a hot cup of peppermint tea and you have the perfect Sunday afternoon at Grandma’s house. My favorite cookies weren’t overly sweet or full of frosting. They were simple treats with just enough sugar to know that they were cookies. Yet, not enough that it could send you into a sugar crash overload. Grandma must’ve known how kids and sugar didn’t mix very well, even back then. Or, is that why we were sent outside to play after our milk and cookies? Could be. I still make my Grandmother’s recipes with my own children. We have to tweak the recipe sometimes to get what we want, yet have as little processed ingredients as possible. When Grandma used white flour and sugar, we get the same flavors and textures by using almond flour and erythritol. This reduces the overall carb load in the cookies, making them a bit healthier to indulge in. 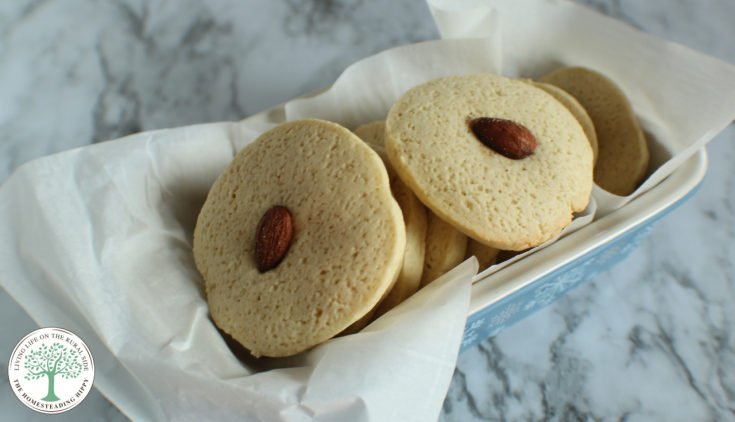 If you would like to dunk them in homemade almond milk, learn how to make that here. These Swedish Almond cookies have a nice, light texture that will hold up to dunking in milk or tea. Or just munching on the sly, if you prefer. The recipe makes 36 1 inch cookies and you can make the dough ahead of time, cut it and freeze it for later if you would like. You can make a smaller batch of cookies each time. What was your favorite memory growing up? What foods do you associate with that memory? Share in the comments and pin this for later! Bring butter and eggs to room temperature. Cream softened butter with erythritol and beat until fluffy. Add in eggs and almond extract. Sift together almond flour and baking powder and add in one cup at a time. Mix well until dough come together. It may be a bit shaggy, but that's okay. Just keep working it with clean hands. Form a 3 inch diameter log with the dough and wrap in parchment paper. Chill in fridge for at least an hour. Bake on a parchment paper lined cookie sheet 8-10 minutes or until lightly golden brown. Store in an airtight covered container for up to 4 days, or in the freezer in an airtight bag for up to 3 months. such an easy recipe! Thank you for sharing! I am not much for baking, so the easier the better for me! One more reason to make some almond extract. These looks delicious! 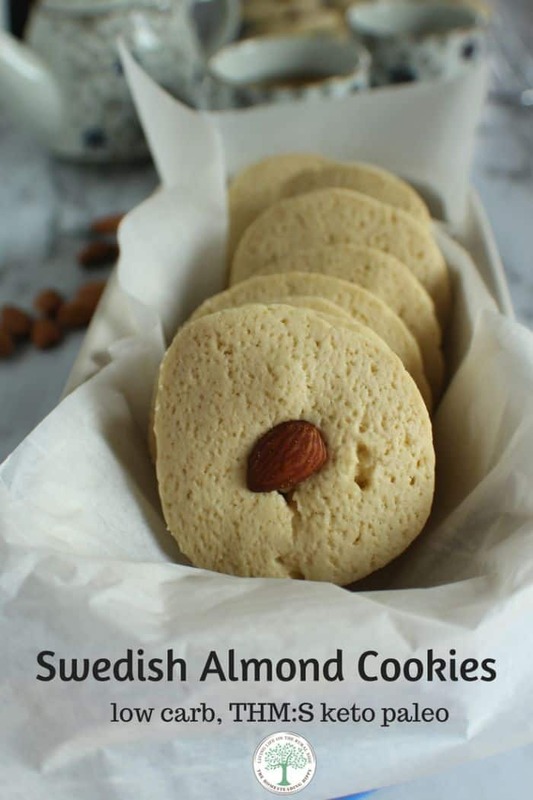 What an easy recipe and I love almond cookies. This would be something fun to bake with my boys. These look yummy! I love to make cookies and some of our favorite cookies are German. I’d expect these to taste similar. Thanks for sharing! It is so fun to be able to carry on traditions from one generation to the next. I love the connection in gives between generations! SO easy and SO yummy! Can’t wait to try these!